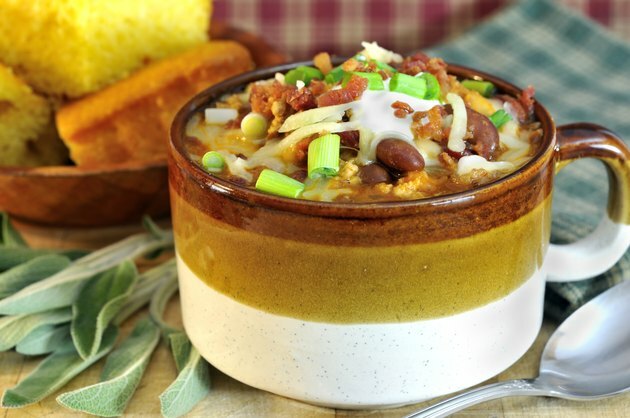 Using ground turkey in place of beef can help you decrease the number of calories in your favorite chili recipe. The number of calories will vary based on the recipe, as different recipes contain different proportions of turkey and beans, the two main sources of calories in this dish. Recipes also use different types of ground turkey, some of which contain more fat and calories than others. A recipe that includes 6 ounces of dark meat ground turkey -- the type highest in fat -- and 5.6 ounces, or about 1/2 cup, of beans per person has about 480 calories per serving. Using 5 ounces of lean ground turkey and 7.5 ounces of beans, or about 3/4 cup, per person results in a larger serving that still has just 490 calories. Reducing your serving size by using just 2 ounces of regular ground turkey and 5.6 ounces of beans per person, as well as just half of the tomatoes used in the other recipes, results in a dish with 275 calories per serving. The size of each serving will affect the calories. If your don't want to stop eating your favorite high-calorie chili recipe, eat a smaller portion and fill up on a low-calorie salad to reduce the overall number of calories in your meal.